Last October I went into studio 4 in Dance Base, Edinburgh with three fantastic women, who are also dancers, to explore and create a movement response to all sorts of F-words which were flowing from my questions about Feminism (past, present and future) and our perceptions and conceptions about being feminine and female. Two questions (or is it one) keep coming up for me: What makes me/you/us fulfilled and what makes me/you/us frustrated? What are the stories and examples from our own experience; what can we share about what has and is happening to us, to our sisters, our mothers, our daughters and to women around the world whose stories touch us. I have set up this participatory performance project to gather personal stories and to explore how text, movement and dance might emerge within and between us, and to see where that might lead? The dialogue about feminism is becoming mainstream again, flowing into our consciousness, providing a new opportunity to look again from the place we are now. As a 52 year old woman and mother of two daughters in their twenties I want to feed this dialogue and offer an embodied participation. We need new ideas and new ways of moving, listening and seeing. Wish us luck with our exploratory beginning of what I hope will become an ongoing performance and participatory project coming to a place near you – soon! And please, if you have stories, images, thoughts, and inspirations you would like to share, please post them. Oh and why the F-word? 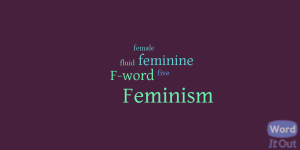 When my ideas started, it occurred to me that Feminism seemed to have taken over from the original F-word (which is everywhere now), as the new ‘dirty’ word that shouldn’t be used any more. Well… after I got over my shock about that, I decided it could be fun to play with it. The floodgates to F-words then just opened up, there are so many amazingly relevant and poignant ones. 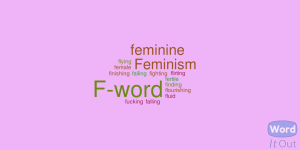 So again, if you want, please post your favourite/s and any stories about why you think that F-word comes up for you or what it means to you. This entry was posted in Uncategorized on 16/03/2015 by debbie.